Edinburgh Monarchs have confirmed dates for their Premier League Knockout Cup quarter-final speedway ties against Glasgow Tigers. Monarchs will host the first leg at Armadale on Friday, July 15 with the deciding leg at Ashfield on Sunday, July 31 with a 3pm start. The KO Cup was the only major trophy to elude Monarchs last season and they are anxious to get their hands on it again after winning it in 2014, the year they achieved the treble. However, Monarchs know it won’t be easy against their oldest rivals who defeated them 51-39 in the league last week. Meanwhile, Monarchs co-promoter John Campbell has revealed that the Monarchs Fans Trust and the Monarchs Grand Draw have made substantial financial donations to the club to help them over a cashflow problem caused by recent washed-out meetings. 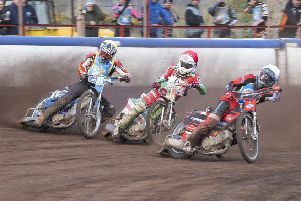 Monarchs duo Sam Masters and Ryan Fisher represent the Capital outfit in Friday’s Premier League Best Pairs Championship at Somerset and the team resume league action at Redcar Bears on Thursday week.